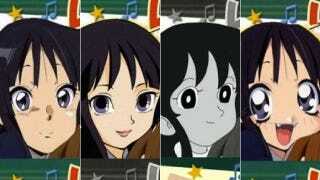 These image of popular anime K-On! has been making its way through the Japanese internet. They show K-On! as the anime actually appears now as well as how it "would" appear if it had been drawn in the 1990s, the 1980s, the 1970s, and even the 1960s. K-On!, of course, is not a decades old anime. It debuted in manga form back in 2007. While the images are hyperbolic and humorous, they do show how Japanese anime has evolved over the years. At the very bottom, there's a tongue-in-cheek image of how K-On! would have appeared in the Edo Period, before schoolgirls rocked out on guitars.